The following is a guest post by Garret Johnson. He is a research assistant for Dr. Ashish Jha at the Harvard T.H. Chan School of Public Health. He also provides RA support to TIE. He graduated from Brown University in 2014 with a degree in French. Find out what grinds his gears on Twitter @garretjohnson22. Nobody who wants to be evidence-based likes zombie statistics. These factoids make their way into published work with little empirical support, get cited repeatedly through the years, and quietly become a part of our collective “knowledge.” And they never, ever, seem to die. Which brings me to the question: how much of our health is due to health care? Austin and Adrianna considered this question at length and on multiple occasions. It started when Austin saw an infographic from the Bipartisan Policy Center that claimed that health care is responsible for just 10% of overall health. The idea of precisely measuring health care’s contribution to overall health seemed like a pretty complex endeavor, so, ever curious, Austin and Adrianna dug deeper into the sources cited by the infographic. The 10% number kept popping up, but its sources never led to any real evidence. Last summer, Health Affairs and the Robert Wood Johnson Foundation published a brief on “The Relative Contributions of Multiple Determinants to Health Outcomes.” Perhaps it points to new, credible analysis to inform our understanding of how health care compares to other factors in determining health. The authors of the brief reviewed 10 studies that “seek to quantify the relative influence of the major categories of determinants on health.” They categorized the various determinants evaluated in the studies as behaviors, social circumstances, environment, genetics, stress, and, of course, medical care. 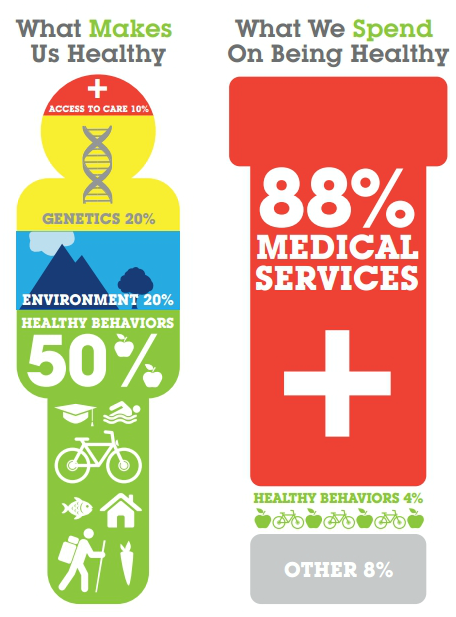 For each study, the brief reports the percentage of health due to each determinant. Only three of the studies consider the contribution of medical care. Aha! This must be the missing source for the BPC infographic’s claim that health care is responsible for 10% of our health. Unfortunately, it seems like pretty weak, outdated evidence. A survey of 40 professionals and paraprofessionals combined with some math gives us, “Health care is responsible for just 10% of health”? Not exactly convincing evidence. Surely, the other sources cited in the HA/RWJF brief can give us a more reliable estimate for health care’s contribution to health? Nope. Just two of the other studies cited in the brief provide an estimate for health care’s contribution to health. One is not an empirical study at all but rather a 2002 review article by J. Michael McGinnis, which cites the 1980 CDC report’s 10% number as a “long-standing estimate” of health care’s contribution to mortality (Austin mentioned this paper in an earlier post). It’s worth noting that “long-standing” is a synonym for old. The other is a 2010 working paper by Bridget Booske on methods for ranking counties by healthiness, which Austin already covered a few years ago. It is based on a variety of methods, including several subjective components (“historical perspective” which somehow converts the history of social determinants of health into a quantitative model, and “pragmatic approach,” which arbitrarily weights all determinants of health equally).